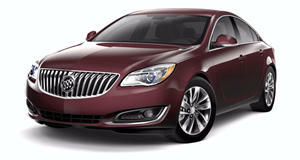 The newly redesigned 2011 Buick Regal represents a proper return to form of a great marquee. For years, Buick struggled to find an identity as it continued to neglect its past. It wasn&apos;t until GM&apos;s bankruptcy in 2009 that Buick, ironically, was given new life. Proper time and money was soon invested as Buick began to share cars with Opel, GM&apos;s European brand. This provided the basis for the new Regal as it&apos;s a properly rebadged version of the award-winning Opel Insignia sport sedan. The new Regal comes standard with a 2.4-liter Ecotec I4 rated at 182 hp. A turbocharged 2.0-liter Ecotec I4 rated at 220 hp is optional. Both engines are mated to standard six-speed automatic transmission and a six-speed manual is optional on the turbocharged version.